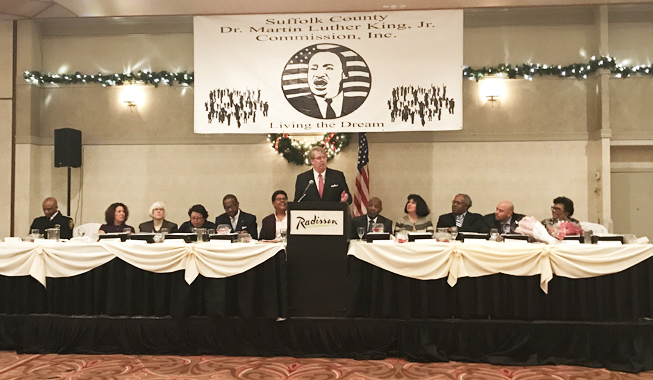 (Hauppauge, N.Y., Jan. 11, 2019) – Long Island Ducks Founder/CEO Frank Boulton was honored by the Suffolk County Dr. Martin Luther King Jr. Commission at its annual luncheon on Friday. "I am extremely grateful to be recognized among so many other distinguished honorees," said Boulton. "We have all learned so many important leadership lessons from people like Dr. King, and I am proud to continue using those lessons throughout the Long Island community." Boulton was presented with a plaque during the luncheon, which was held at the Radisson Hotel Hauppauge - Long Island. He also presented a speech to hundreds of attendees at the reception for honorees. Suffolk County Sheriff Dr. Errol D. Toulon was the Keynote Speaker at the event. Also in attendance at the luncheon were newly-elected New York State Attorney General Letitia James and Suffolk County Executive Steve Bellone.